Wes Anderson began his cinematic journey as a Sundance wunderkind with Bottle Rocket in the mid-90s. Now twenty years and eight feature films into his directorial career, he finds himself at a rather interesting triangulation in the movie world. He’s developed a devoted following with films like Rushmore and The Life Aquatic with Steve Zissou. He’s garnered Oscar nominations, perhaps most notably for 2001’s The Royal Tenenbaums, which many consider his masterpiece thus far. He’s managed to turn some heads among mainstream viewers and critics with the stop-motion spectacle Fantastic Mr. Fox and the undeniably loveable Moonrise Kingdom. This last film, Anderson’s most recent before this new arrival a few weeks ago, ranks as one of his most successful films both from a critical and box office perspective, having garnered a 94% positive rating on Rotten Tomatoes (his highest) and brought in an estimated $45.5 million at the box office (his second highest total behind ‘Tenenbaums’). 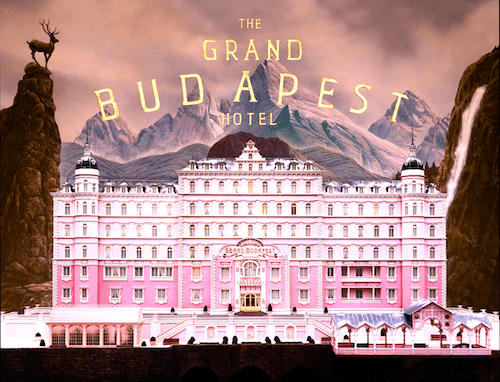 So the stakes are pretty high as Anderson comes into 2014, with the release of his new movie The Grand Budapest Hotel. Whether you were hoping for the quintessential Anderson quirk or the push into the mainstream, the question is, did Anderson deliver in his new film? Short answer: yes. I should perhaps acknowledge that I am a diehard Wes Anderson fan (at this point the naysayers are welcome to shake their heads and stop reading this article with a sigh and a passing, “Well of course he’d like Wes Anderson’s new film!”) Though this may be true—and, indeed, the man can do almost no wrong in my eyes—it is still my responsibility to judge with a critic’s eye as best I can. And so begins my defense of The Grand Budapest Hotel, though if one should consult the oracle of Rotten Tomatoes, one would notice that according to most, the film hardly needs any defense. Still, onward we go. The Grand Budapest Hotel chronicles the endeavors of one M. Gustave, the charismatic, fastidious, philandering concierge at the Grand Budapest Hotel, situated in the fictional eastern European country of Zubrowka during the heyday of Henry Jamesian, pseudo-Victorian, Art Deco brilliance that was pre-World War II Europe. Gustave, played to near perfection by Ralph Fiennes in an uncharacteristically humorous role, mentors the new lobby boy, refugee Zero Mustafa—played by excellent newcomer Tony Revolori—who has come to the Grand Budapest to escape civil conflict, only to find war approaching the hotel’s doorstep—quite literally—soon after his arrival. Gustave has made a habit of, shall we say, servicing the rich, elderly female guests of the hotel. One particularly loving and rich matriarch bequeaths to Gustave an incredibly rare and valuable painting, “Boy With Apple,” upon her mysterious and sudden death. What follows is a sort of mystery action caper rife with prison escapes, high speed ski chases, art heists, murder intrigue, and the rise of fascism and imminent world war. It must be said that this film’s success extends far beyond the plot, for, entertaining though it is, the story alone does not fully explain the cinematic success of this film. On one hand, Anderson pushes his limits when it comes to the film’s genre. A man known best for his quirky family dramas, in Budapest he tackles war, theft, action, and violence. It’s refreshing to see a clearly talented director step outside of his comfort zone and put his own spin on many Hollywood tropes. One reason Anderson succeeds in genre-jumping is that he is tactful enough not to stretch himself too thin—that is to say, all the genres and tropes tackled in Budapest are done through the incredibly unique eye of Wes Anderson. The action sequences are fun to watch not because they are full of convincing CGI but because they have an almost slapstick mechanical tangibility about them. The trains look like model trains. The Grand Budapest itself looks like an elaborate dollhouse from the outside. Throughout the film we see every single one of his trademark cinematic moves: meticulous, almost diorama-like shot setups; fastidious set and costume design; consistent color palettes (note the shades of pink, blue, and yellow throughout); long, complex tracking shots; wide angles with whip-pan camera movements—it’s all there. However, it’s almost to excess. As a friend who accompanied me to the movie noted afterward, “That’s probably the most Wes Anderson-y of Wes Anderson’s movies.” He has a point. Part of what makes Anderson’s cult-like following so noteworthy is its somewhat polarizing nature. There are those for whom Anderson’s quirky, idiosyncratic style is unappealing or inaccessible, and, indeed, in Budapest, there’s a near Anderson overload. That being said, however, in spite of all the bright colors and deadpan looks and grand, sweeping tracking shots, never did the film feel overindulgent. There’s an incredibly detailed intentionality to his shots, from the blocking to the sets to the camera movement, and his bright, occasionally flamboyant camera work and production design all lend themselves to the poignant atmosphere he’s creating, a nearly-comic, insular caricature of prewar Europe made exclusively to tell this story. Furthermore, the colors, the quaint sets, the funny mustaches, the elaborate costumes, and more all contribute to the furthering of the film’s main theme: nostalgia. What separates Wes Anderson from many directors is his clear dedication to the art of cinema. It’s clear that Anderson is a true student of film as an art form, not just as a means of entertainment. In its own unique way, The Grand Budapest Hotel is an allegiance to an age-old art form that is hard to come by but still rings powerful for many. The film is presented in a telescopic style: the credits open in current day, at the gravesite of a famous Zubrowkian author. Then it flashes back to the 1980s, when said author reflects on one of his greatest books, aptly titled The Grand Budapest Hotel. The film then flashes back again to the 1960s, when the decrepit, communist-run Grand Budapest is being occupied by vagrant artists, including this famous author in his youth, who meets an elderly Zero Mustafa—now the owner of the hotel—and prompts yet another flashback as Zero tells the story of M. Gustave and the prewar glory days of the Grand Budapest. Within this nesting doll of stories, Anderson deftly alters his directorial style from time period to time period, and this is where we see Anderson the cinematic artist really come alive. The 1960s Communist hotel shots are very still, with slow, lethargic pans mirroring the malaise of the essentially defunct hotel, while the shots of the prewar, 1930s Grand Budapest heyday are, for lack of a better term, grand, in scope, in tracking movement, even in color. It should be noted to the watchful cinematic eye that even the aspect ratio (the black bars that appear on the sides of the picture) change for each layer of film, as if the camera itself is mirroring and paying homage to the filmic styles of each period being portrayed. Wes Anderson has pulled off quite the feat in realizing his vision of the past. He doesn’t exactly paint the broad strokes of alternative history that, say, Quentin Tarantino might, yet his film is also not strictly a period piece, for it transpires in a world that never existed in the first place. It allows us to look upon the past without judgment, to remember well the art, the film, the literature, the people, of a bygone era. It is a meta-cinematic presentation, in which every possible ounce of the film oozes this nostalgic wonder at times past. Zubrowka mirrors prewar Europe in so many ways yet is clearly fictional, allowing its image to remain intact, unchanging through time. Where Anderson’s previous films typically focused on character development—we could never forget the likes of Max Fischer, Eli Cash, and Steve Zissou—The Grand Budapest Hotel is about a whole world, about a cast of people long gone but not forgotten. On the contrary, they are well remembered and preserved in a time capsule of cinematic bliss. This past world is given homage not via inspiring historical drama but through heartfelt, borderline obsessive recreation of that environment in a way that will make the viewer laugh, cry, reminisce, and appreciate what rewards the meticulous artistry of a masterful director can offer.